The GMO Debate: How Do We Feed a Growing World? 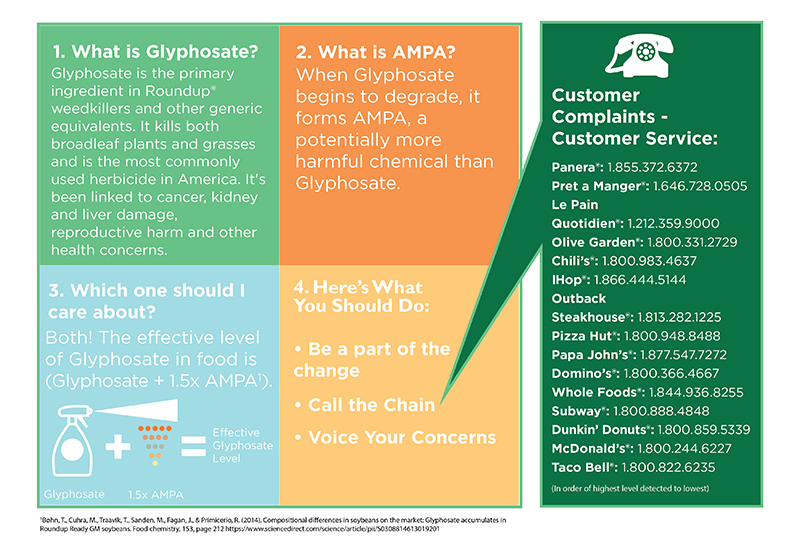 A new round of food testing commissioned by GMO Free USA found that glyphosate and its break down product or metabolite, aminomethylphosphonic acid (AMPA), are pervasive in foods served by major restaurant and fast food chains in the United States. Glyphosate is the primary ingredient in Roundup herbicides and other generic equivalents, which are the most widely used weedkillers in the United States and in the world. Over 250 million pounds of glyphosate are sprayed annually on crops in the United States. Foods from Chili’s Grill & Bar, Domino’s Pizza, Dunkin’ Donuts, IHOP, Le Pain Quotidien, McDonald’s, Olive Garden, Outback Steakhouse, Panera Bread, Papa John’s, Pizza Hut, Pret a Manger, Subway, Taco Bell, and Whole Foods Market were tested. Other surprising results came from testing Whole Foods Bakery Honey Wheat Bread, Dunkin’ Donuts multigrain bagel, Olive Garden breadsticks and Subway 7 Grain Honey Oat Bread. Both beverages, Dunkin’ Donuts Arabica coffee and McDonald’s unsweetened iced tea, tested positive. Thirty eight different menu items were tested, some more than once. Glyphosate was detected in 39 out of the 44 restaurant food samples tested, in 33 of the 38 menu items. Foods with no glyphosate detected included beef, chicken, egg and sweet potato. Glyphosate is a chemical linked to cancer by the World Health Organization’s International Agency for Research on Cancer (IARC). In 2015, the IARC categorized glyphosate as a probable human carcinogen. In 2017, California state scientists also categorized the chemical as a probable human carcinogen and listed glyphosate in its Proposition 65 registry of chemicals known to cause cancer. Recently, a California jury ordered Bayer-Monsanto to pay $289 million to DeWayne “Lee” Johnson, who is terminally ill with Non-Hodgkins Lymphoma, developed after his repeated exposure to large quantities of Roundup and other glyphosate-based weed killers while working as a school groundskeeper. While the judge subsequently reduced the award to $78 million, the verdict stands. Currently, over 11,200 people diagnosed with Non-Hodgkin’s Lymphoma after environmental exposure to glyphosate-based herbicides are also suing Bayer-Monsanto. In addition to external exposure, there are concerns about glyphosate in food. Glyphosate is heavily used in conventional agriculture but is not allowed to be used in organic farming. A new French study which surveyed nearly 70,000 people found that participants eating an organic diet had a 25% lower risk of developing cancer, with more significant differences in cancer rates for Non-Hodgkins Lymphoma (as much as an 86% reduction) and postmenopausal breast cancer (Baudry 2018). This was even after accounting for factors like socioeconomic status and exercise habits. The authors of the study write “the relationship between organic food consumption and cancer is still unclear,” and as expected, they call for more in-depth research which is clearly needed. It would be remiss to focus solely on the cancer risks associated with glyphosate. Studies have linked glyphosate to other harmful health effects at levels detected in a single serving of some of the restaurant foods tested. A 2018 study suggests that glyphosate can cause genetic damage to human lymphocytes, which are an important part of our immune system (Santovito 2018). Studies have also reported kidney and liver damage in rodents, including non-alcoholic fatty liver disease (NAFLD), in some cases at glyphosate levels as low as .05 parts per billion (ppb). (Seralini 2014, Mesnage 2015, Mesnage 2017). The prevalence of NAFLD in the U.S. has been shown to be increasing over time. In 2005, 15% of the population had NAFLD. Currently, between 30 and 40% of adults and 10% of children in the United States have NAFLD (National Institutes of Health). Multiple servings per day increase health risks. If, for example, you were to eat a bagel and coffee tested in the study for breakfast, a bagel and a cookie from the study for lunch, and a sub sandwich from the study for dinner, there could be increased health risks. At those levels, animal studies suggest that glyphosate may be an endocrine disruptor (Gasnier 2009, Myers 2016) with the ability to potentially reduce testosterone levels (Clair 2012, Abarikwu 2015) and impair sperm quality (Abarikwu 2015). Along with an increase in glyphosate use on crops, there has been a 500% average increase in the level of glyphosate found in human urine (Mills 2017). One study found that higher urinary glyphosate levels in pregnant women were associated with a shortened gestational length, potentially reducing lifetime cognitive achievement (Parvez 2018). Another study observed that chronically ill humans had significantly higher glyphosate residues in their urine than their healthy counterparts (Kruger 2014). In 2010, the President’s Cancer Panel weighed in on the health risks of endocrine disruptors and carcinogens to children, both before and after birth. “It is vitally important to recognize that children are far more susceptible to damage from environmental carcinogens and endocrine-disrupting compounds than adults. To the extent possible, parents and child care providers should choose foods, house and garden products, play spaces, toys, medicines, and medical tests that will minimize children’s exposure to toxics. Ideally, both women and men should avoid exposure to endocrine-disrupting chemicals and known or suspected carcinogens prior to a child’s conception and throughout pregnancy and early life, when risk of damage is greatest.” (The President’s Cancer Panel 2010). This is an extremely strong statement that must be taken seriously. AMPA has not yet been as widely studied as glyphosate. Yet, AMPA was observed in an in vitro study to be more toxic than glyphosate on human embryonic kidney and placental cells, and glyphosate and AMPA together were found to be even more toxic than glyphosate or AMPA alone (Benachour 2008). How Does Glyphosate Get Into Our Food? Glyphosate goes hand in hand with “Roundup Ready” genetically modified crops such as corn, soy, canola, sugar beets and cotton (for cottonseed oil). The GMO crops are sprayed multiple times during the growing season to control weeds. Many people are unaware, however, that glyphosate is also used as a desiccant, ripening or drying agent, on non-GMO grains and other crops including wheat, barley, oats and other grains, sugar cane, lentils, beans, edible peas and chickpeas, sunflowers, mints, potatoes and cantaloupe. When the crops are nearly mature, farmers spray glyphosate-based herbicides on the crop to kill the plant, causing it to dry down for a quicker harvest. In cases where glyphosate is used for weed control in rows between plants, it is often taken up by the plant or tree roots and makes its way into coffee, oranges, etc. (Schrübbers 2015). Glyphosate and AMPA have been detected in the air, sources of drinking water, and rain water (Majewski 2014, Battaglin 2014). AMPA is considered to be more persistent in the environment than glyphosate (Cox 1995). What is a safe level of glyphosate in food? In response to the dramatic rise in glyphosate use and the resulting increase in glyphosate residue in crops and food, the agrichemical industry has petitioned the Environmental Protection Agency (EPA) to incrementally increase tolerance levels – allowable “safe” levels – of glyphosate residues in crops and food. This is despite credible scientific evidence pointing to the need to lower the acceptable daily intake for glyphosate. (Myers 2016, Cuhra 2016, Ibrahim 2016) The allowable levels of glyphosate in food were deemed “safe” not because there was scientific evidence proving their safety, but to accommodate farmers who were overusing the herbicide. With studies cited above suggesting health problems at levels as low as .05 parts per billion, it’s hard to make a case for any level at all being safe. Choose organic options when available. National organic standards prohibit the use of glyphosate and other synthetic pesticides. Unlike terms such as “natural,” “organic is federally regulated and the word cannot be used without certification. Avoid conventional multigrain or whole-grain/whole wheat bread, bakery items and pastas. Avoid conventional oat-based foods including cookies, muffins, and cereals like oatmeal and granola. Familiarize yourself with the crops desiccated with glyphosate before harvest and do your best to avoid them. Avoid foods made with genetically modified crops such as corn, canola, soy, sugar from sugar beets and cotton, as such crops are commonly sprayed with glyphosate-based herbicides. Vote with your dollars. Marketing departments do an effective job of selling comfort and security. Demand that these multi-billion dollar chains do better! You have the power. Call the corporate offices of the restaurants you frequent and tell them you saw this report. Tell them to publicly commit to taking swift action to rid their foods of glyphosate. Tell them that this is a matter with public health consequences and it is their responsibility to test their supply chain and to provide their patrons with safe food.